Binary gender identity is strictly for capitalists! “This is a forward-thinking and compassionate day for New Yorkers” declared the Sandinista. In the fairest big city in America, we have a mandate to further our commitment to justice and access for all transgender, non-binary, and gender non-conforming New Yorkers, Also, those who wish to change their gender identify on their ID card will not have to pay an extra fee. Assuming the gender identity change of heart happens in the same calendar year as the issuance of the ID card. We are sending a clear message that all New Yorkers, of all gender identities and expressions, belong and deserve to be treated with dignity and respect. Unless they are conservatives. They will have to pay through the nose. Serves them right. Damn binary gender freaks! Are there real balls in meat balls? I only ask because they were slapping against my chin as I ate them. I have this growth on the inside of my thigh. Might be a third ball. Might be a skin tag. Will this affect my gender identity choice? Would you like to see my external genitalia? 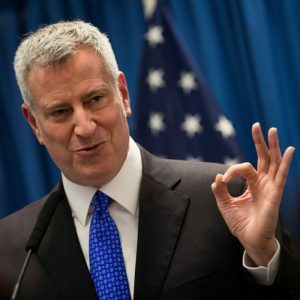 I’m sure I speak for all New Yorkers when I say well done, Mr. Mayor. Well done. By the way do any of my readers know a good lawyer. I’m serious about those weed wacker instructions. They’re everywhere, Infidel. Last I heard was Cardinal Dolan was busy mansplaining to Cuomo.